Riserva Wine Spa provides for outside guest’s: dressing room, bathrobes, towels, cosmetics, disposable underwear and slippers. Towels are available in the locker rooms with the lockers, in the sauna baths or treatment room. In case, you don’t find the mentioned products please contact the spa personnel to provide them immediately. Before you leave, please leaves the towels and bathrobes in the white baskets in the locker room, and the disposable products can be thrown away. We kindly recommend to our hotel’s guest to consult the Spa etiquette listed on the hotel’s website. 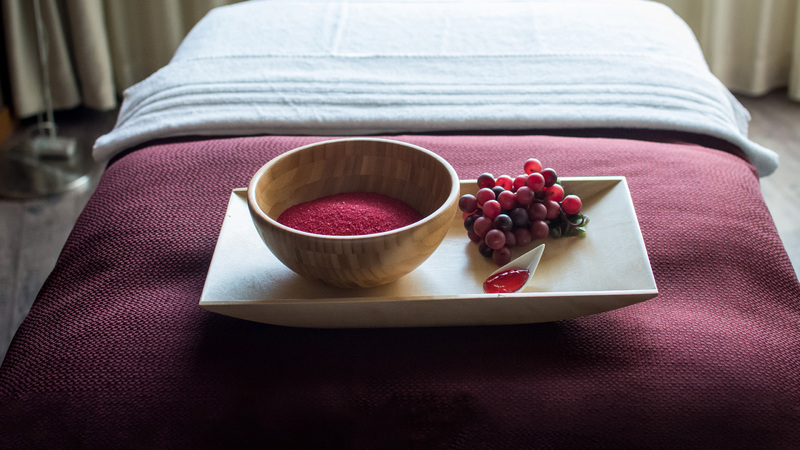 The spa environment is specifically designed to provide tranquility and relaxation. Please respect the right to privacy and silence of the other spa guests by refraining from using mobile phones inside the location. Smoking is not permitted in the spa area (except the outdoor terrace). Appointments: To schedule a treatment or receive further information, please contact the spa reception +40 359 403 335, spa@ramadaoradea.ro. Reservations in advance are encouraged. We invite you to check the promotions page riserva.ro to keep up with the special offers. Your contact details are necessary to guarantee you reservation (name, e-mail, phone). Before you benefit from any spa treatment or facility, we kindly ask to stop by the Spa Reception to (re)confirm your appointment. You have the opportunity to indicate a preference for a male or female therapist. Cancellation policy: Out of respect for our other guests cancellations or reschedules may be made with a minimum of 4 hours before the appointment time. Cancellations made with less than 2 hours before the scheduled time will attract penalty of 100% of the procedure value. Appointments can only be changed depending on availability. Please fallow the treatment according to schedule because it can happen to overlap with the other guests program and will be unable to respond positively to your request. Pre-treatment Life form – Health State: Please inform your therapists regarding any health issue, allergy or prior accident that might influence the treatment or the use of the spa facilities. On the first arrival you will be asked to fill in on your responsibility a questionnaire regarding your health status as to allow us to offer you a perfectly safe service. Spa dress code: For spa procedures please remove jewelry and clothing, keeping only the underwear. For some treatments, the therapist will provide disposable underwear. If your treatment involves water therapy, it is necessary to wear a bathing suit. For best results of facial treatments for the gentlemen, it is recommended to be clean- shaven. General access to treatments rooms and spa facilities: Access is based on the RFI card, which you receive in the spa reception. In case of access problems, please call the spa reception to assist you. Treatment rooms: Please inform therapists if you feel comfortable, if you feel too hot or too cold, if the massage is too light or too firm. Our goal is for you to benefit from a unique and comfortable experience. Saunas: It is recommended to announce in advance the spa reception about the time you want to use saunas to ensure that the temperature is proper. To ensure the hygiene and comfort of all guest a towel around the waist is necessary for the spa unisex area, please do not sit directly on the wooden benches, use textiles provided near the saunas. Showering between sauna programs is mandatory. Terrace: The terrace is arranged in sunny days with a bar, showers, sun-beds and lounges. Please request from the spa or hotel reception towels for terrace. Outside Jacuzzis: Jacuzzis are located on the hotel’s terrace, at the 7th floor. The temperature in the Jacuzzis is adjusted according to the outside temperature. It is recommended to announce in advance the spa reception about the time you want to use Jacuzzis to ensure that the temperature is proper and to provide you towels. Fitness: Use facilities and equipment to your own responsibility. No supervising personnel are available, please use the equipment properly according to the displayed instruction, return all equipment to its place after use and clean the handles of the equipment with disinfectant wipes (on towels wardrobe) preparing them for the next user. Please use sportswear. It is not permitted to utilize outdoor shoes. Please dispose of the water bottles / glass in the container next to the water dispenser and the used towels under the table. Please maintain adequate sound and music level that do not inconvenience other guests. Saline: Please maintain an adequate sound and music level that do not inconvenience the other guests. Please use bathrobes and disposable slippers available if you relax on the saline beds. Children access: Under the age of 12 (inclusive) children’s access to the spa is forbidden. Children between the ages of 12 and 18 are permitted in the spa facilities only with a companion. Children have access to Jacuzzis and saline, the access to the sauna and fitness is not recommended for medical reasons. For age-appropriate treatments, please ask spa reception for assistance. Pregnancy: In the initial pregnancy semester, we do not perform any treatment. For mothers-to-be we have created special treatments. We are at your service to offer the most appropriate therapies for this period. Suggestions: Your recommendations are welcomed. To improve the quality of our services, please fill out the satisfaction form obtainable in spa reception. Lost objects: Seifs to store valuable items or money are available in the locker room. Spa employees are not responsible for any personal or value goods. Lost items are retained for a return for a period of 6 months in the hotel, after are donated. In case we don’t own your contacts (email, phone) to inform you about your lost items they are stored and donated according to the hotel’s internal procedures. Payment Methods: Credit cards (Visa, Mastercard, Maestro, *American Express – * only at the hotel reception), cash, gift cards – please inform the spa staff about your payment methods. Gift Cards: They are the perfect gift for any anniversary or special occasion. The gift cards are not redeemable or chargeable by cash. Please ask for more details regarding the terms and conditions at the Spa reception. Food and beverages order: Is forbidden to bring food and beverages from outside the hotel. A menu is available at the spa reception or at riserva.ro. Orders and serving of food and beverages in the spa area can be made: Monday to Friday between 14-22 hrs and Saturday to Sunday 10-22 hrs (21.30 last orders). Serving the products can take a bit longer than the normal waiting time because the products are prepared and sent from The HUB restaurant, located on the ground floor of the hotel. For a more complex menu, we invite you to visit The HUB restaurant.